Arrows pointing at the successful score, unlike its twin on the bench, bisected. 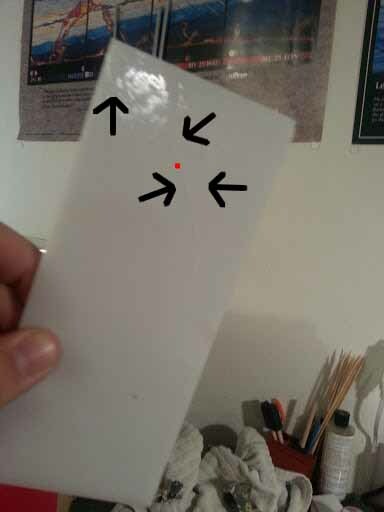 Red dot where I started tapping. 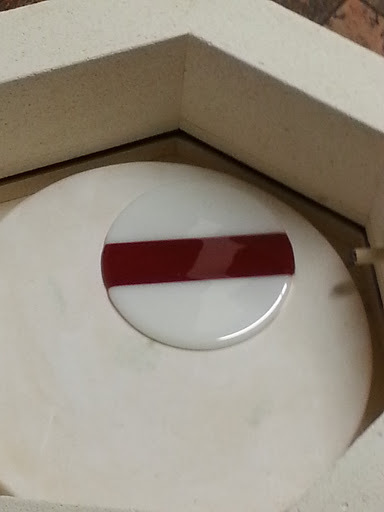 Fortunately this is a fusing test. Below is the documentation I used for an ornaments class at St. Nick's Tourney/Toys for Tots, in the Barony of the White Waters late 2012. The safety section, most of the first page, is intentionally dark. It is based off of the safety section from How to Work in Stained Glass by Anita and Seymour Isenberg, which made me laugh for hours (and, as a result, I've never forgotten the rules). I've taught the class three times, but only decided to write docs for the third time, since it was at a significant event. I was a little nervous when HRM AnneMarie took a copy of the docs, and I had to quickly explain. Fortunately she said she likes dark humor. 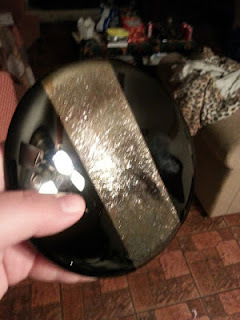 I reference a story in the docs, about the first ornament I made. 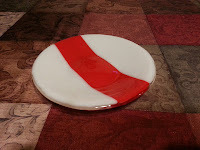 I originally learned this technique at Chicago Hot Glass during a 2-hour mini-class. 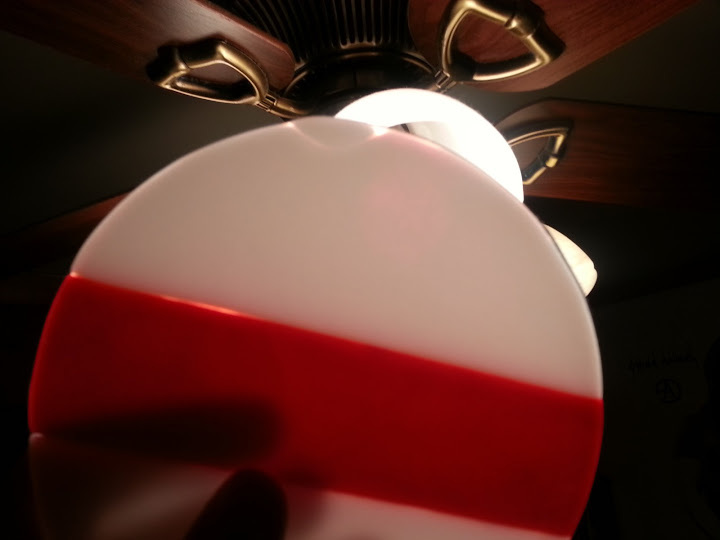 When you blow the bulbs too hard it gets so thin it has the consistency of saran wrap.... very thin, sharp, and hot. That glass breaks into dust and flies away easily. I learned this first hand when I made this mistake, aimed at my neighbor's face.... fortunately no one was hurt! Closed-toed shoes required! If you are wearing anything less and there is an accident, how will you count to 20 for the rest of your life? Don't chase glass! 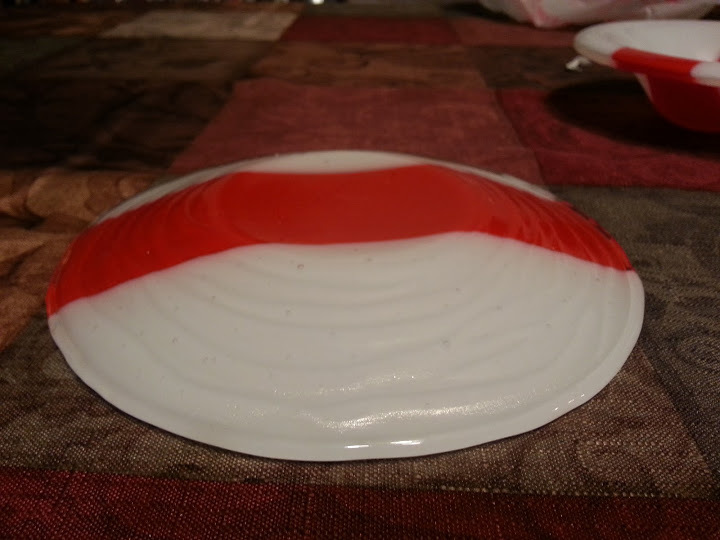 Try and imagine a beautiful glass ornament you've worked hard on for 20 minutes. Imagine it slipping out of your grip and tumbling through the air, glittering as it goes. Imagine it shattering on the floor. Imagine getting over it! It doesn't matter how good your medical insurance is, a trip to the ER for stitches and burns is not worth a few dollars in glass and fuel! This is a cardinal rule of glasswork of any kind! Besides, you'll have more fun making it again after we sweep up the shards. Party like it's 1099°... Glass doesn't begin to glow until around 1100 °F (or hotter!). Unless you are very sure how long a piece of glass has been cooling, assume it is 1000° (and remember skin sublimates at 800°). Use tools and gloves to handle dubious glass. Lead Poisoning is very period, but let's overlook that at the torch. 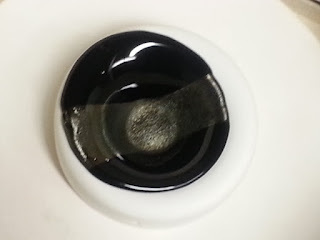 If you are working with glass powder or very fine frit, inhaling it could lead to lead poisoning (death), silicosis (death), and wasting glass (worse than death). Use these substances in a well ventilated area, ideally a fume hood! 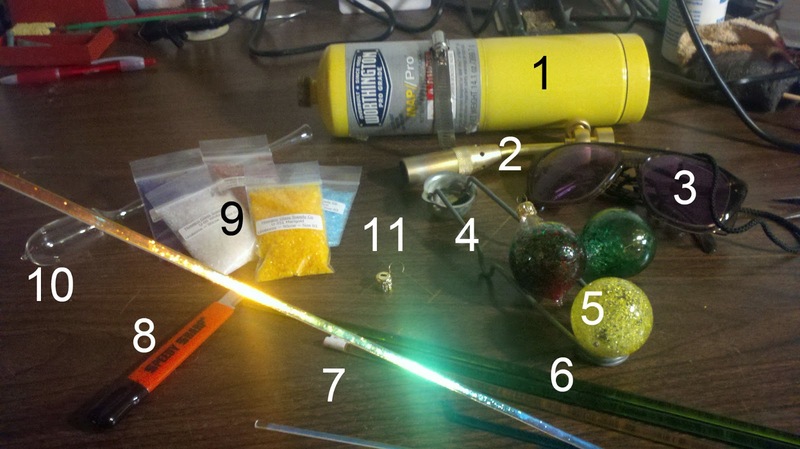 This should not be a problem while making ornaments, but its worth mentioning anyway! The history of glass ornaments is almost as brief as this paragraph, relatively speaking. Unfortunately ornaments are NOT period, but they are a fairly safe introduction to lampworking, which is. The first glass Christmas ornaments were made in the area around Lauscha, Germany in the mid-1800s. This was made for my brother to store a deck of tarot cards, something he collects. I used a tube hinge and it worked fine. 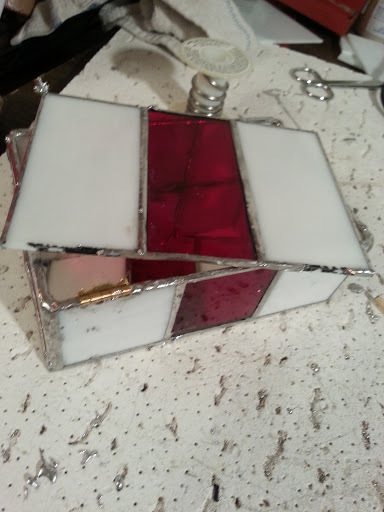 While browsing a supplier's website, I saw they sold hinges for glass boxes that appeared like regular hinges. I got the idea to try this out, and bought hinges at a local hardware store and ground them down. Unfortunately, these are not much easier to place. 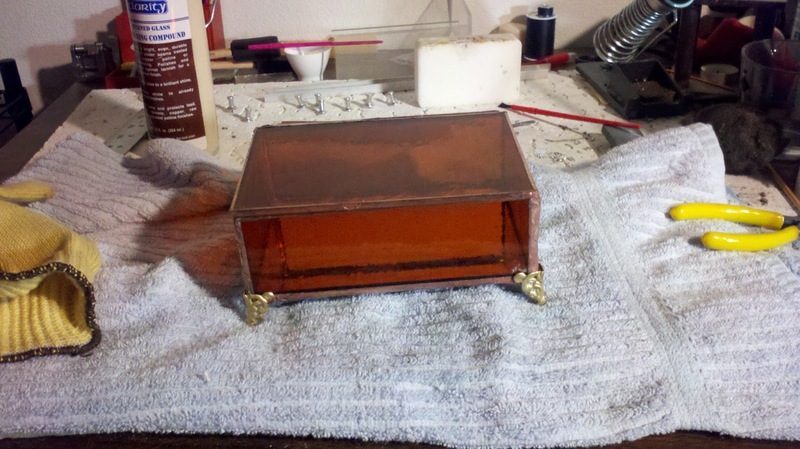 My first "pale" project I thought of was the same box pictured above. I made the base and sides and got sidetracked. Recently for a holiday party I tried to complete it in a hurry. I finished the lid, got the hinges ready, and managed to build a solder bridge between them. I ended up tearing the hinges out and not having anything for the white elephant exchange. This set of instructions made me realize my first mistake may be in not tinning the contact parts up front. I think for my next attempt (which will be to finish this pale box) I'm going to try the traditional L-shaped elbow hinge and see how it works for me. Then I can finally finish this box up and free up the bench space. Right now it is an ugly mess, after having to rip it apart. 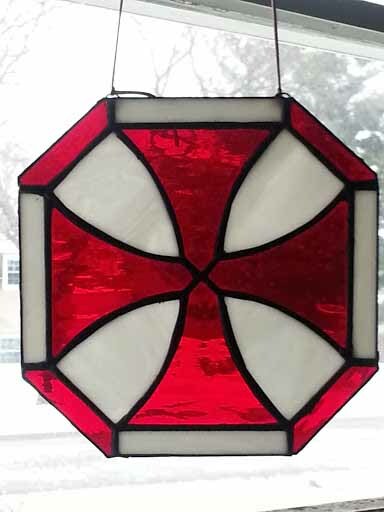 This was commissioned by my SIL's co-worker, a history buff and fan of the Knights Templar. 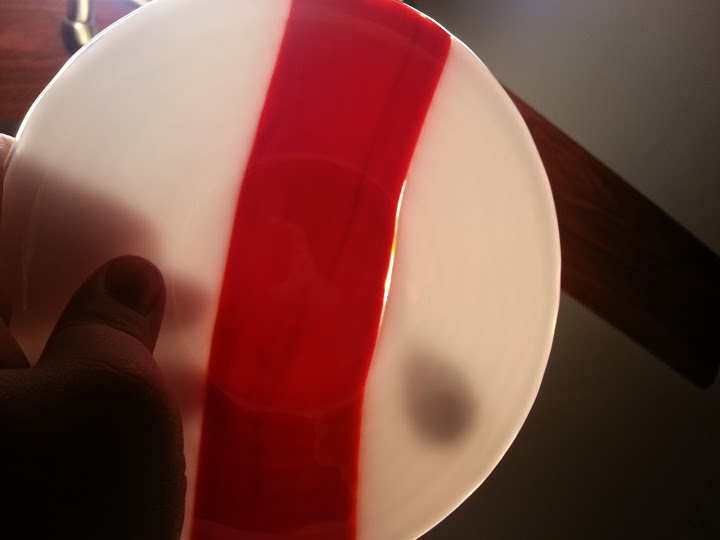 It's made with red waterglass from Spectrum. The white is some kind of evil mutant glass that still haunts my bench; I'm considering pitching it all instead of throwing good time after bad money. 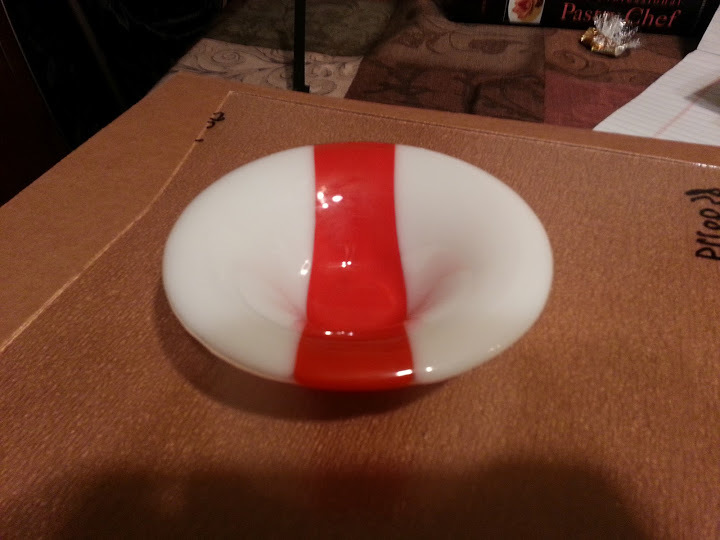 The white glass appears to be almost a clear/white mix. 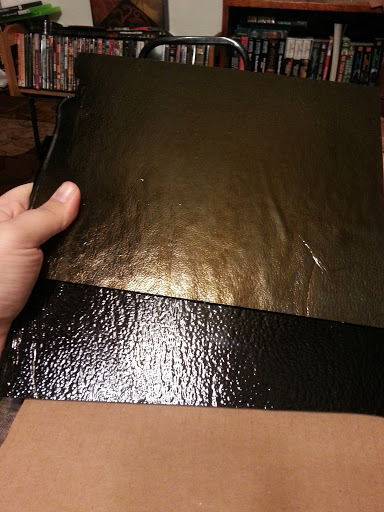 There is an odd texture that makes me believe it, and it has been notoriously difficult to cut. Many glasses that are supposed to be a pain (Youghiogheny comes to mind) work fine for me. This one mis-broke every time. It is of unknown manufacturer, as I bought it from a local shop and didn't note the ID number which has long since worn off. 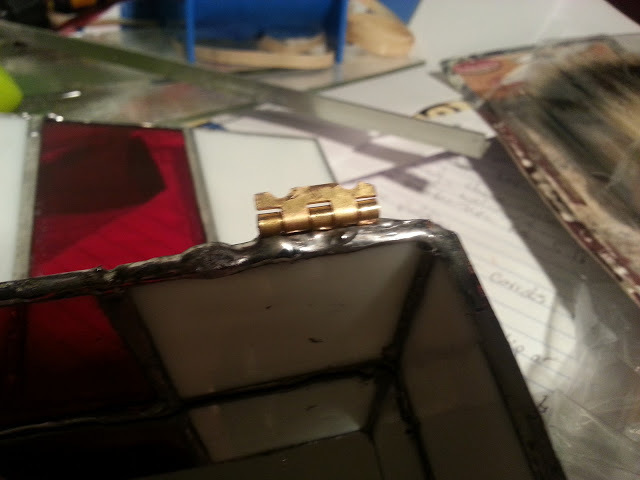 I had to repair multiple pieces while it was still being made. At one point I was soldering outside and it managed to slide off my little portable table, breaking pieces. Thermal shock while soldering broke another, something I've never had happen before or since. I'm rather relieved to have gotten it this far. Viewing it completed, I think I'd prefer it with a border, even if it's just zinc came. A wooden border would also be nice, but I think both are ruled out because the thinness of the border. We have won a bid to host the Kingdom A&S competition and Crown Tourney in May. During a feast prep inventory we discovered we need some small bowls and plates. In an effort to jazz it up a little for the eight seats at Head Table, I volunteered to make eight bowls and eight plates featuring the Midrealm pale. These are going to be promptly washed and given back to HT to keep. 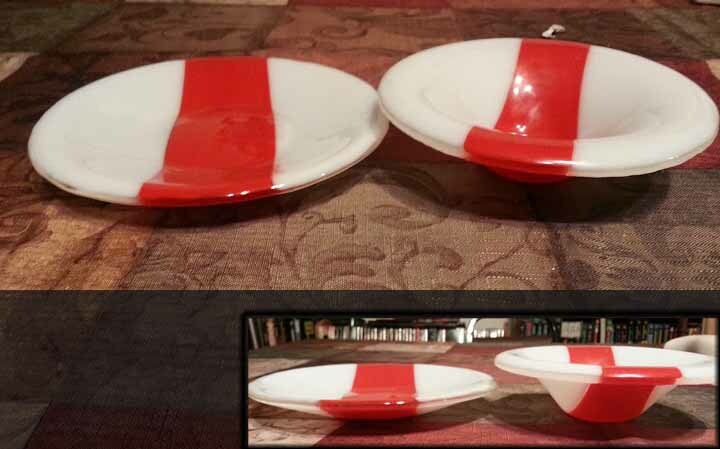 The red and white glasses are unspecified because I bought them from my favorite storefront, and the information was not listed or recorded (and the glass quickly cut up before the number on it was noted). The clear was purchased online from Delphi, making the details better known. 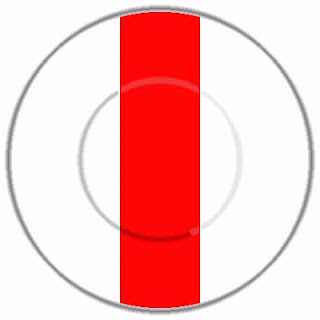 Cut with a circle cutter so that the blank ideally has proportions of 2.25", 1.5", 2.25" so that the pale (red stripe) is not quite on even footing with the white field (in heraldic terms), although that is not required. This is a common presentation, even if not strictly correct. 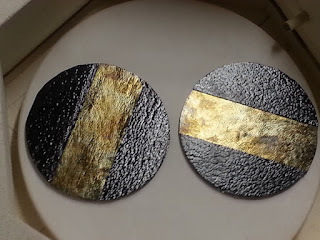 I use duct tape to bind the three strips together tightly, flip them over, place them into my circle cutter, and if the glass gods are kind, I end up with a circle. Remove the three pieces from the duct tape. The cuts on the red strip are so subtle I pop them easily with my running pliers. 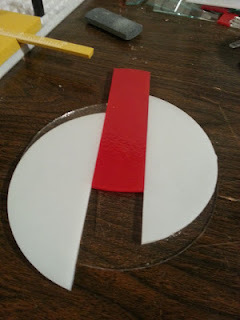 The cuts on the white stripes are much more substantial; I make perpendicular relief cuts like I would would with a solid circle and tap them out with the back end of my glass cutter. 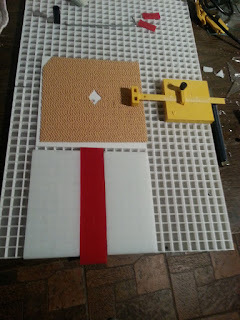 This seems to be more reliable than the idea of slowly applying pressure on either end of the cut with running pliers. The process is much the same as above, but the sizes of the strips are different. After cutting with the circle cutter the desired end proportions are 2.5" white, 2" red, 2.5" white (for a 7" pattern). I discovered that I mis-remembered my past measurement and my plate mold is actually 6.5" in diameter. A quick check during a holding cycle showed that the extra .25" rim didn't droop like I feared, but slumped successfully. 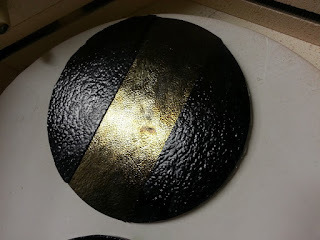 I'm not sure if I will stick to these numbers or go ahead and make a 6.5" blank next time, but I suspect the latter, though the end result was fine. 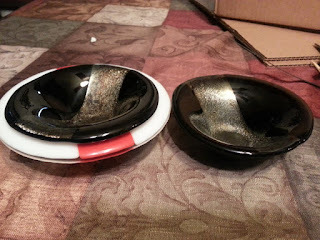 Same fusing and slumping schedules used as for the bowls. 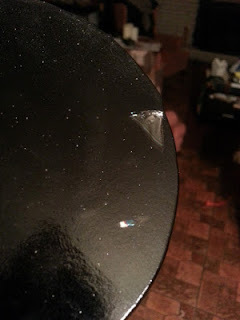 In this picture you can see little dimples where the crack was, both at the inside edge (where the crack met the red stripe in a 3-way "joint") and at the outside edge, where it looks like clear glass filled the gap instead of white. Holding the piece itself you can see the crack is lighter in color, although the surface is smooth. It looks like the clear base fills in the gap instead of the white, and while there doesn't appear to be any weakness, it is visible. Another variation of this turned up when I made the plate, though you can see it in the last photo as well. Fusing is no replacement for good cutting and fitting! There was a slight error or shelf present and the red stripe was not in as solid contact with one white piece as it was the other. As a result, on close inspection, you can see how the clear again made up the difference. I didn't think to measure the finished blank to see how much the size changed. 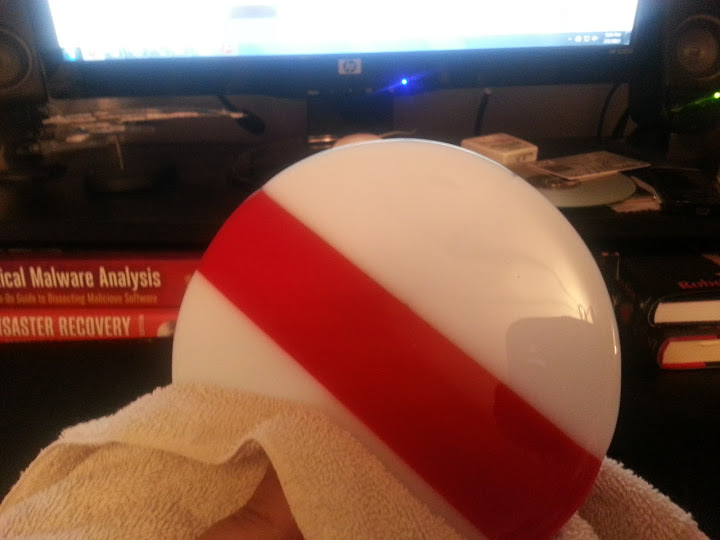 With the second one I did measure it, and found out it actually shrank slightly! 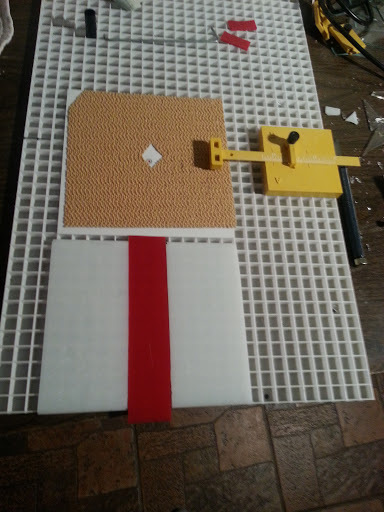 My understanding from a Bullseye Technote (I think) is that warm glass wants to be 6mm thick, and it should contract or expand to try and reach that level. The glass base I'm using is 3mm, and the colored glasses are 3mm. I expected no change. M. Sigulf suggested that the rolling process actually makes the sheets a little thinner than the official spec, and as a result it contracted a bit. 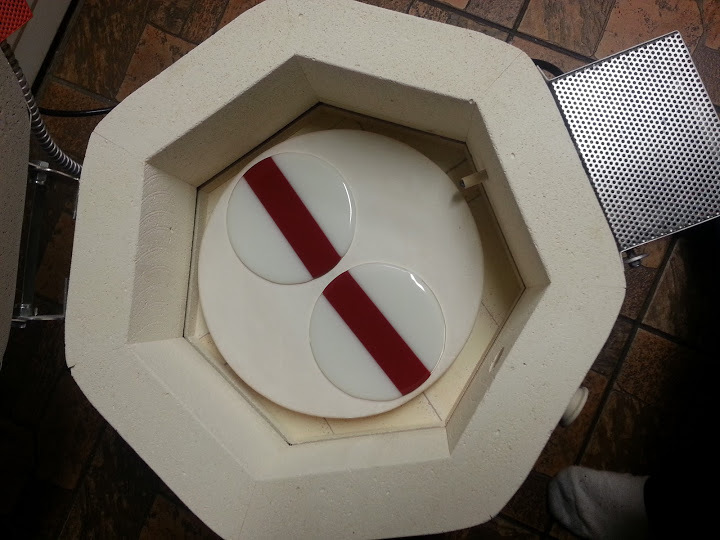 Fortunately, with 6" disks and a 13" kiln shelf, I can actually get two blanks fused at once and save some firings. Unfortunately the plate mold we are using is 7"; It will be back to single firings for that, unless I want to make 6" plates instead. Decided to use this blog as a handy way to track glass experiments and projects, instead of facebook and 10 other places. If you are reading, welcome!